Franklin Police Officers responded early this morning to the McKay’s Mill Subdivision after several residents awoke to find that their vehicles had been burglarized overnight. Detectives are investigating. 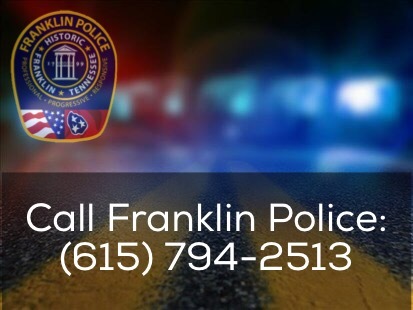 Franklin Police are asking McKay’s Mill residents to keep an extra eye out and report any suspicious activity to Franklin Police: (615) 794-2513. Officers in both marked and unmarked cars are providing extra patrols in the neighborhood. Removing valuables from your vehicle and locking your car doors can greatly reduce your chances of becoming the victim of this type of crime. A Crime Stoppers reward of up to $1,000 is being offered for anyone who anonymously provides information that leads to an arrest in these incidents.